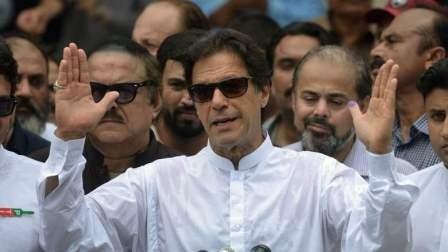 Vote counting in an election marred by allegations of fraud and militant violence has been tediously slow, yet from the outset cricket star Imran Khan and his Tehreek-e-Insaf (PTI) party have maintained a commanding lead. Election officials say it will be Thursday evening local time before an official count confirms Pakistan's next government. But before even half the votes were counted, Khan's leading rival, Shahbaz Sharif, who heads the Pakistan Muslim League, the party of jailed ex-prime minister Nawaz Sharif, rejected the vote, generating fears that disgruntled losers could delay the formation of the next government. More than 11,000 candidates vied for 270 seats in the National Assembly, and 577 seats in four provincial assemblies. The Pakistan Tehreek-e-Insaf (PTI) of former cricket hero Imran Khan was well ahead of other parties as unofficial results poured in from across Pakistan after the day-long polling, marred by a deadly suicide bombing, closed at 6pm. Gallup Pakistan estimated turnout at between 50 to 55 per cent in an electorate of nearly 106 million. The voter turnout in the key province of Punjab was 55 per cent. At the time of going to press, the PTI led in 107 National Assembly constituencies against the Pakistan Muslim League-Nawaz (PML-N) of ousted premier Nawaz Sharif, which was leading in 71 seats. The Pakistan People's Party (PPP) led by Bilawal Bhutto Zardari - son of slain prime minister Benazir Bhutto - was a distant third, leading in 39 constituencies. Independents were ahead in 20 seats, while the Muttahida Majlis-i-Amal (MMA) lead in 09 constituencies. The Muttahida Qaumi Movement-Pakistan were ahead in just seven. In this scenario, the PTI is likely to form a coalition government. The PML-N and the MQM alleged widespread rigging and rejected the results. TV reports showed election workers sorting through massive piles of paper ballots at polling stations across the country. There were more than 19 million new potential voters, including millions of women. Election researcher Azeema Cheema said the contest was "too competitive to call", with the most populous province of Punjab likely to be the key following fierce campaigning in battleground areas there. Khan, 65, cast his vote in Bani Gala, a suburb of the capital Islamabad, telling the media it was "time to defeat parties which kept this country hostage for years". In Lahore, rival Shahbaz Sharif called on Pakistanis to "get out of their homes and... change the fate of Pakistan" before casting his own vote and flashing a victory sign. But other voters in Lahore, capital of Punjab and traditionally a PML-N stronghold, said they were abandoning the party in favour of the PTI.